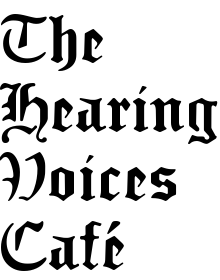 Margit Säde speaks at The Hearing Voices Café about her exhibition “source amnesia” – on text produced in unconventional ways, sometimes as the result of extreme and hallucinatory perception. Source amnesia is the inability to remember where, when or how previously learned information has been acquired, while retaining the factual knowledge. This branch of amnesia is associated with the malfunctioning of one’s explicit memory. It is likely that the disconnect between having the knowledge and remembering the context in which the knowledge was acquired is due to a dissociation between semantic and episodic memory – an individual retains the semantic knowledge (the fact), but lacks the episodic knowledge to indicate the context in which the knowledge was gained. Memory representations reflect the encoding processes during acquisition. Different types of acquisition processes (e.g. 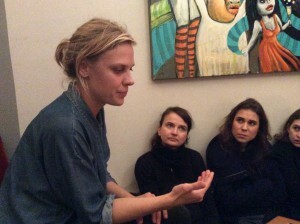 : reading, thinking, listening) and different types of events (e.g. : newspaper, thoughts, conversation) will produce mental depictions that perceptually differ from one another in the brain, making it harder to retrieve where information was learned when placed in a different context of retrieval. Source monitoring involves a systematic process of slow and deliberate thought of where information was originally learned. Source monitoring can be improved by using more retrieval cues, discovering and noting relations and extended reasoning. More information on Margit Säde “source amnesia” exhibition can be found here. And here.